Do you remember the Indiana highway construction of the 1960’s and 1970’s? Many apartment buildings, and even more homes, were demolished during the construction of I-65 – impacting all areas, but particularly Fountain Square and the Old Northside. Both areas were severed from downtown and their close neighbors, Fletcher Place and St. Joseph, respectively. Entire blocks were erased. In 1957, the state announced that it would plan freeways connecting downtown Indianapolis to the outer belt system (I-465) that was also being planned. In the early 1960’s, the state began purchasing homes, commercial buildings, and every other structure in the highway right-of-way and was met with much resistance – particularly in areas that would suffer economically. Prices offered for homes and other buildings were protested by owners; the Community Service Council of Indianapolis pushed for assistance for displaced families to assuage the situation (The Polis Center, IUPUI). The state built the I-65 interchanges between 1968-1971. Ultimately, particularly Fountain Square felt a dramatic decrease in population (17,000 residents in the downtown area total were displaced) as well as access to social services. Additionally, the west and northwest sides lost a significant portion of housing built between 1870-1910 (The Polis Center, IUPUI). 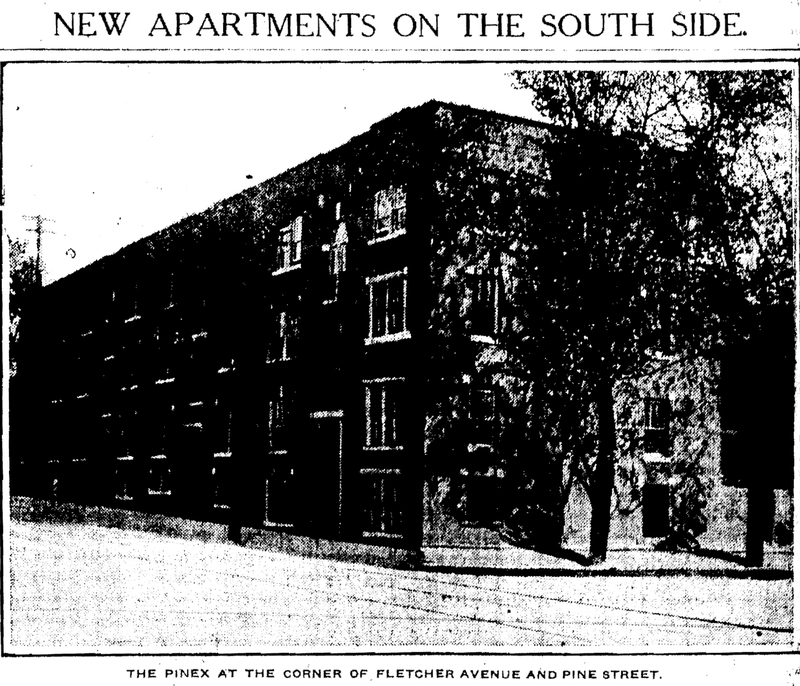 Two buildings lost in the gray zone between Fletcher Place and Fountain Square were the Pinex Apartments and the addition, referred to together as the Pinex Courts at 808 Fletcher Avenue. On “one of the city’s most beautiful avenues on the South Side,” the Pinex was built in 1917 at the corner of Fletcher Avenue and Pine Street (“New Apartments on the South Side,” IndyStar, 10/7/1917). Due to its close walking distance from the commercial district as well as its placement along the English Avenue car line, it was a desirable location. The Pinex was made of brick and stone, with eight apartments on each of the three floors. 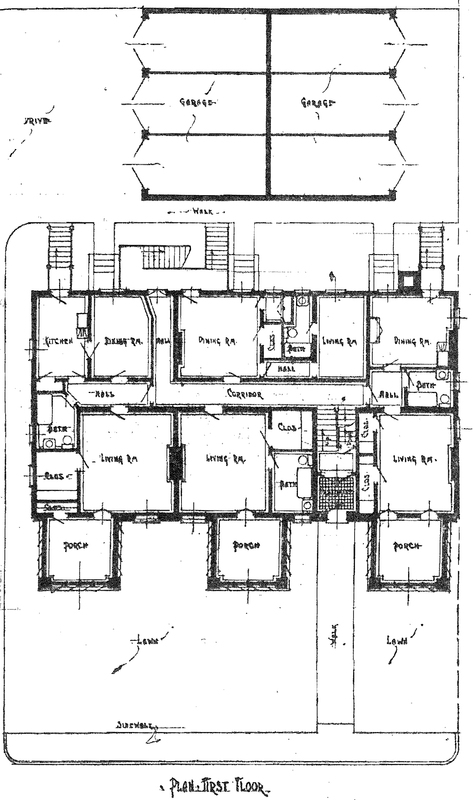 A description of the layout in the paper states that “each suite is a gem of the home-planner’s art…The separate apartments comprise an individual hall loading to every room excepting the kitchenette. West of this hall is the large, well-lighted living room. To the east is a spacious dining room, with a niche comprising a handy dressing room, into which a bed disappears when not in use… The bath, located off the hall, is complete with a spacious linen closet and medicine cabinet. Back of the dining room is the kitchenette, with an icebox…range, sink, garbage incinerator.” (IndyStar, 10/7/1917) The interior woodwork was comprised of a Flemish oak finish and natural tones. The following year, the apartments were listed for $27.50 a month to rent (IndyStar, 5/5/1918). It was designed by C.L. Bacon for the owner, Fred M. Meiere. Meiere was a successful businessman in real estate, belonging to the Indianapolis Real Estate Board and the Indianapolis Rental Board as well as having his own company, the Meiere Realty Company. In 1912, he and his wife had been in a deadly car accident in Toledo, Ohio. His wife and the other driver died. At this time it is stated that he lived at 537 North Tacoma Avenue (“Body of Women Who Died in Auto Accident Arrives,” IndyStar, 9/17/1912). He continued to develop properties after he recovered from his injuries. 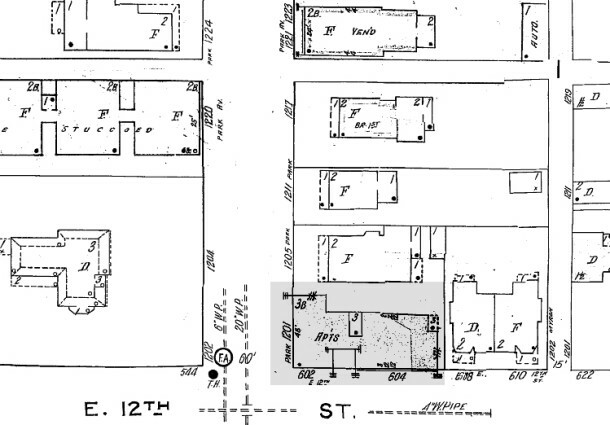 After this he moved to 2711 North Meridian Street, perhaps to be closer to new developments he was working on at 17th and Meridian Street and also 17th and Illinois Street, called the Seville Apartments (“Boards to be Guests,” IndyStar, 12/3/1921 & “Real Estate Board Will Lunch at New Seville,” IndyStar, 12/8/1921). 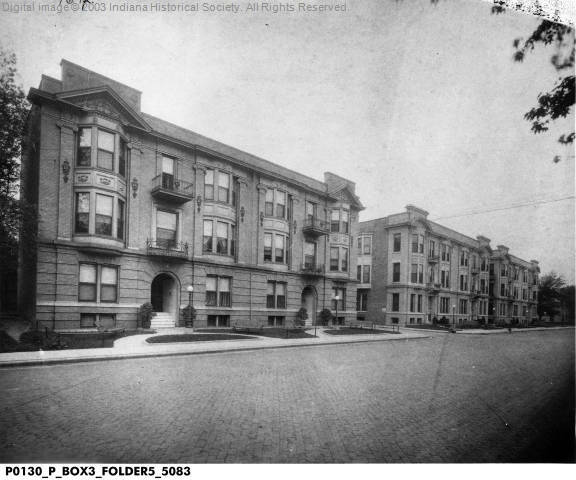 He was coined the “pioneer in the construction of high-class small apartments for the South Side” in the article that discusses the second structure built to the Pinex Courts in 1919 (“New Apartment for South Side Will House Thirty-Seven Suites,” IndyStar, 4/19/1919). This second three-story structure was built just east of the original Pinex Apartments. 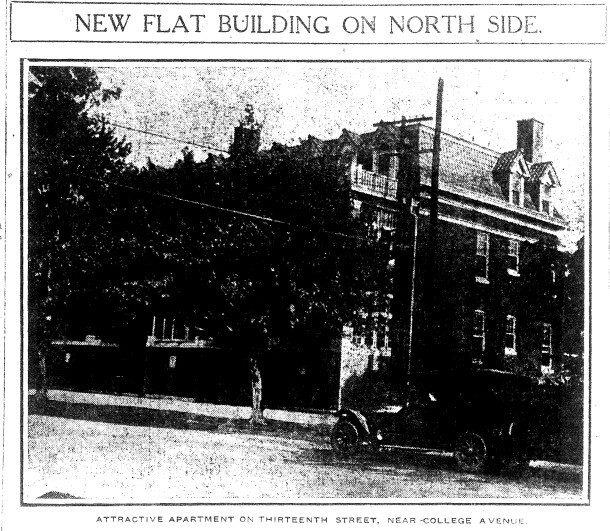 The thirty-seven apartments cost the Meiere Realty Company about $75,000, with such features like In-a-Door beds, twelve and eight foot ceilings, built-in dining tables and seats, large windows, and office space for a doctor and a dentist somewhere on the first floor (IndyStar, 4/19/1919). This building was designed by the local architecture firm of George, McLucas & Fitton; construction of the brick and tile building was awarded to the Builders Construction Company of Indianapolis. The total number of suites between the two structures totaled at sixty-three. It was listed in the 1940’s and 1950’s as The Fletcher Apartments then reverted back to its former name by the 1960’s. It was torn down in 1970. 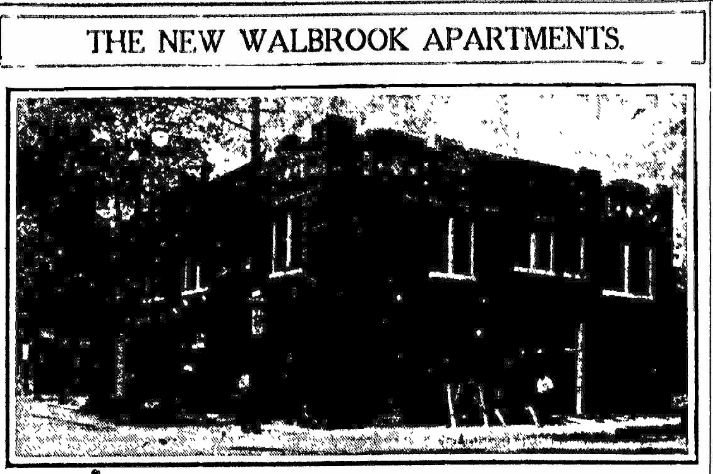 The Walbrook Flats were built in 1916 at 1104 College Avenue (sometimes listed as 1124-1126) and 670 East 11th Street. 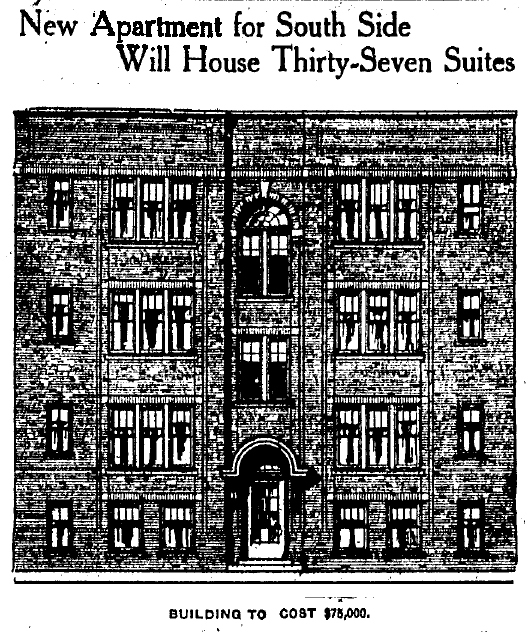 The “exceptionally well-built, attractive and thoroughly modern” flats were only two stories with six apartments on the second floor and four storerooms on the ground floor, making it a commercial/flat type (“The New Walbrook Apartments,” IndyStar, 5/28/1916). This unique area was semi-business and semi-residential, with the College Avenue car line stopping at the apartments and also 11th Street at the time was a boulevard with many flower gardens visible from the apartment. The land formerly was owned by Allen R. Benton, an early president of Butler (terms in 1861-1868, 1886-1891). Designed by the Walker-Brooks Realty Company, developers who also worked on similar projects at 48th Street and College Avenue and also 42nd Street and College Avenue, the fireproof building is made of brick (IndyStar, 5/28/1916). The storefronts face College Avenue, and the apartments were accessible from an open court in the rear of the building as well as a front stairwell. 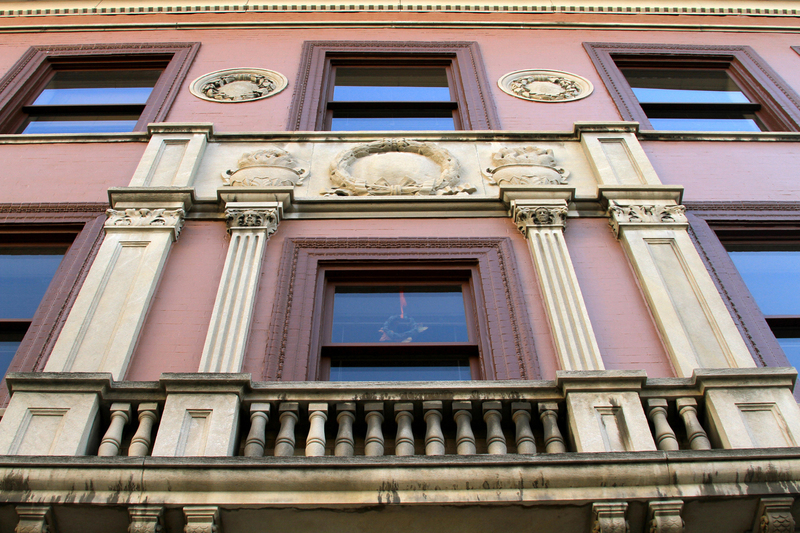 The six apartments, with twelve foot ceilings, were described as “virtually duplicates, each having three rooms, including living room, dressing room, bath, solarium, and kitchen. All the available space has been cleverly utilized with closet and an oscillating portal bed in the living room, which doubles the sleeping capacity of each apartment, and serves as a very nice ornamentation for the room.” (IndyStar, 5/28/1916) Before the building was even completed, three of the four storefronts were rented – a drug store, a grocery store, and a tailor/dry cleaners would move in to the building. 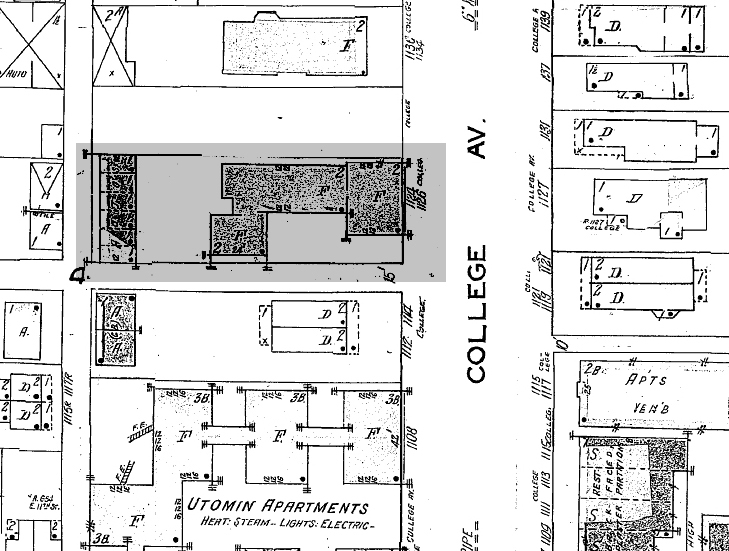 The building was unique beyond its commercial/flat design, which was rare in the Old Northside, but also due to its irregular shape and extremely large old forest trees that paralleled the building on the south side. In 1919, an apartment here went for $35 a month (IndyStar, 12/28/1919). 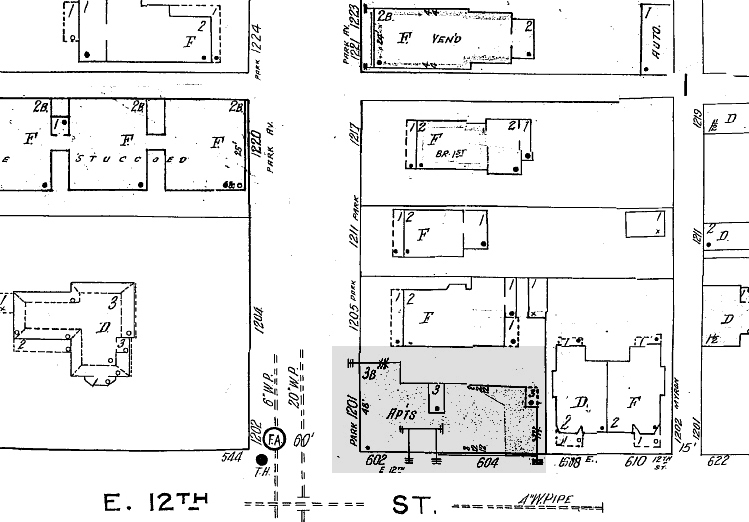 Another Old Northside apartment building lost was the Gausepohl Flats at 1236-1242 North College Avenue, along with the Gausepohl Annex at 655-651 East 13th Street. Built in 1916, the three-story plus basement apartment annex was comprised of twelve units of one to four rooms each to compliment the first structure built two years before which faced College Avenue. Designed by Charles H. Byfield (architect of the Heier and the Woessner) and built by O.O. 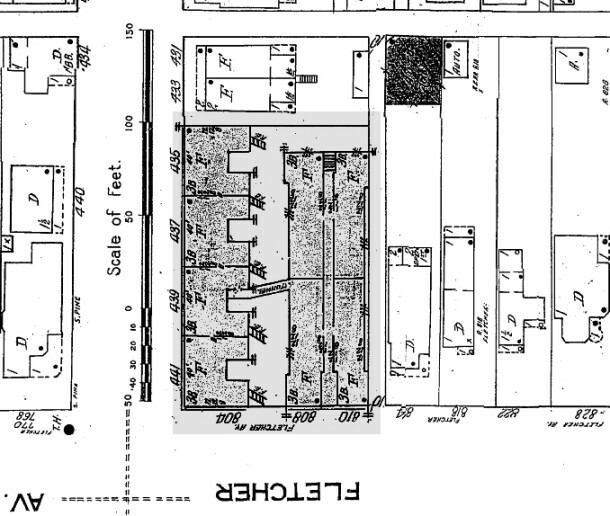 Oberlies, the building was made of Western brick in reds and browns, white stone trim, and topped with a red tile roof (“New Flat Building on North Side,” IndyStar, 8/13/1916). The interiors were done with oak parquetry floors and a light green paint; but no two apartments were designed identical, according to the interior decorators, W.L. Amthor Company. The apartments were outfitted with murphy In-a-Door beds. A large back entrance with iron stairs overlooked a private lawn in the backyard (IndyStar, 8/13/1916). Like many other flats, the Vonnegut Hardware Company supplied the In-a-Door beds, but also contributed the “A B” gas ranges, hot plates, Indiana refrigerators, laundry stoves, and all bathroom fixtures as well for these apartments. 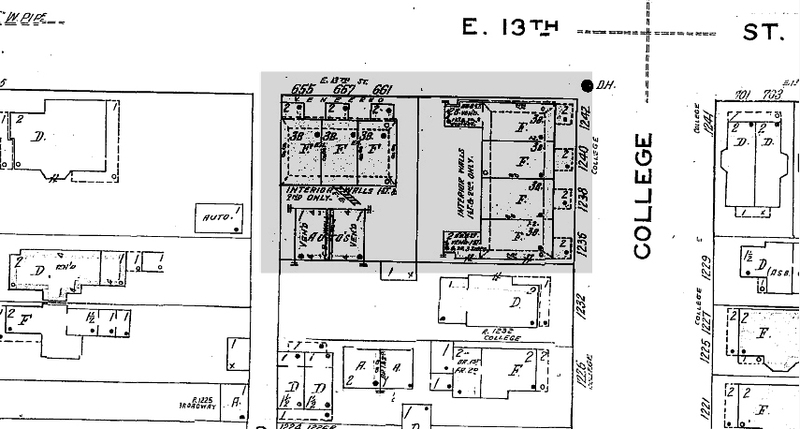 Both buildings only had eight foot tall ceilings, and multiple ads suggested no children. Named after E.J. 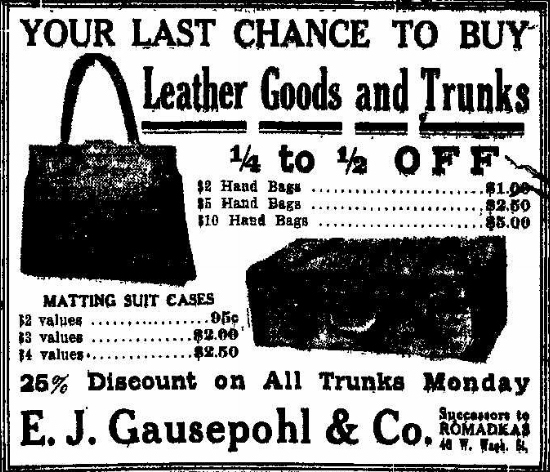 Gausepohl, a businessman with a successful leather goods shop downtown on 27 West, then 40 West, then 38 West Washington Street as well as 30 North Pennsylvania Street who also was a shriner. He was the second Vice President of the Indianapolis Commercial Club in 1911 – first Vice President being H.M. Glossbrenner (“Newly Elected Officers and Directors of the Indianapolis Commercial Club,” IndyStar, 2/15/1911). He was also elected treasurer of the Chamber of Commerce multiple times in the 1910’s (IndyStar, 2/28/1915). The building was demolished in 1968. 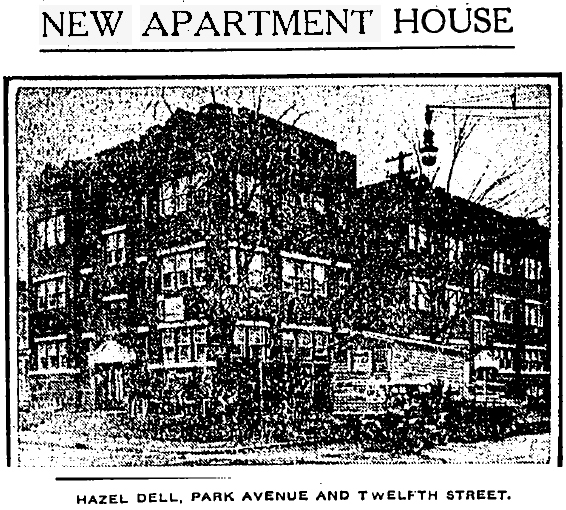 A humble building on the northeast corner of Park Avenue and 12th Street, the Hazel Dell Apartments, were constructed in 1917 at 1201-1203 Park Avenue and 604 East 12th Street. Now a parking lot for the Morris-Butler House Museum, this apartment building was right on the boundary between the interstate construction right-of-way and unaffected areas. 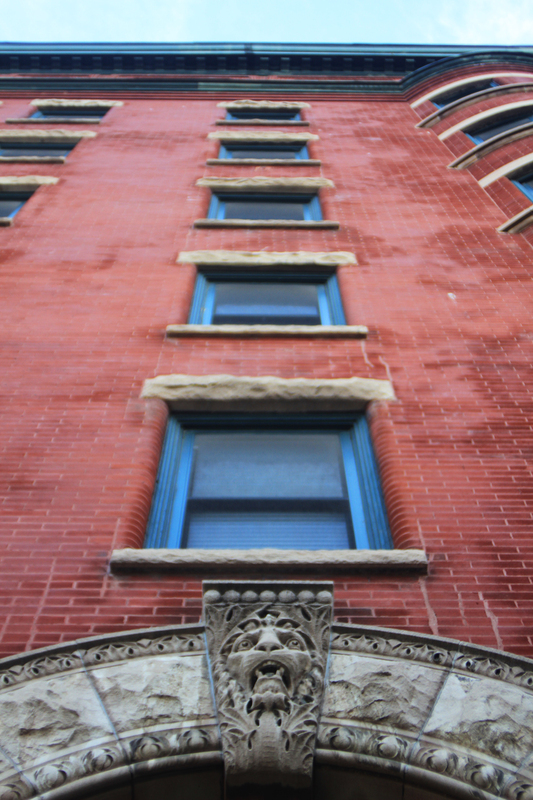 The pressed brick structure was comprised of three-stories with eighteen apartments, nine in either wing. The irregularly shaped structure had twelve foot ceilings and only eight feet in some places. It was described as having “a large reception room, living room with a large closet and an In-a-Door bed, an individual hall, bath and a large and complete kitchen. 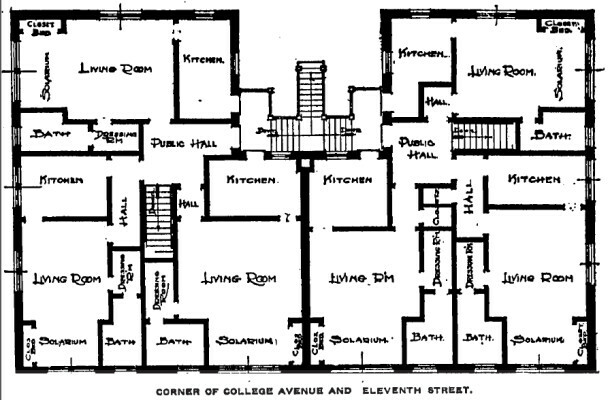 The rooms are dainty and homelike… there are hardwood floors, tile entrances, and the interior decorating, even to the electrical illuminating fixtures, were selected with good taste.” (“New Apartment House,” IndyStar, 11/25/1917) The area was a desirable location, with it being on both the College Avenue car line and the Central Avenue car line. It was built by B.M. Pace. It was mostly likely demolished to make room for building materials and construction space, as it was demolished in 1970. Can you find any information on the Old Central Restaurant Building? It was a business that sold anything you could find in a restaurant,school,hospital,any where that has a kitchen. My husband worked there before it was sold and an additional building was built on the property to make new apartments. My mom told me my great grandmother worked in a 3 story brick building in that area that made bib overalls around the turn of the century (1901) . I’d like to find out if indeed this is the structure my great grandmother worked at….It is across the street from the Red Cross building. 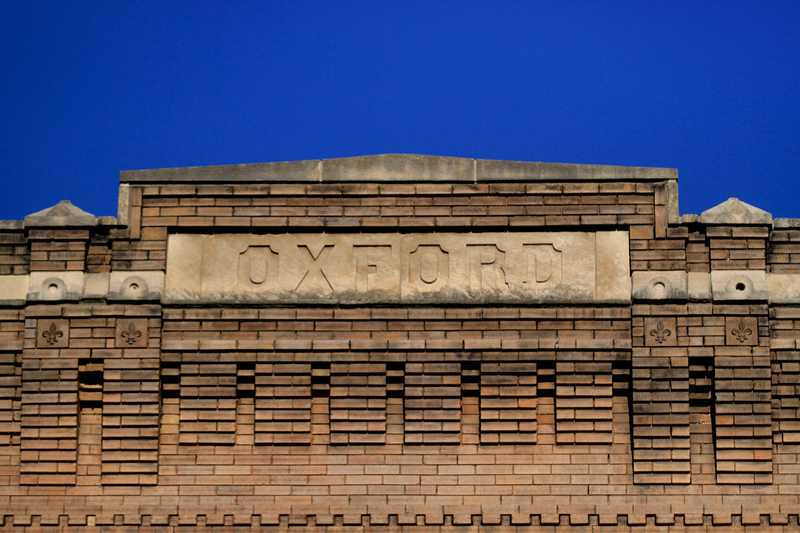 the address is 1010 N. Central Ave.
Any photo’s of the building in it’s glory days would be much appreciated. How wonderful that Jordan’s article stirs some of your memories. We don’t have ready archives in our possession, but if you would like to make a donation to support the time it would take to research a specific topic, please email us and we will see what we can do to help you! In the meantime, thanks for your comment and for reading! An excellent historical article! Keep up the good work! excellent article. thank you. every building has a story, most of which end untold. Thanks, Dan! And there are so many more apartment buildings that were torn down because of the interstate. It was hard to choose what to focus on. Maybe I’ll have time to do a few more around this theme this summer. I agree – excellent article. Did you create the overlay maps of the Sanborn Insurance maps and the Interstate conscruction? Thanks, Michael. Yes – well my boyfriend created the maps. I found that most maps showing the interstate were crude line drawings, and I wanted something with the sanborns underneath. I didn’t copyright them because my boyfriend doesn’t care about ownership of these. Feel free to use them if you need to! The story was related to me just last week by James Divita author and retired history professor at Marion University that if it wasn’t for a short phone call form the Lilly’s saying “move that road”, Central Avenue United Methodist Church which is now Indiana Landmarks would also have been gone when I65 was built. I didn’t know that, Tom. That’s wild. Nice connecting with you on here! — Taking advantage of the modern technology has been one of the things which has kept America a leader in the world. Being tethered to the train was holding this country down. Great sacrifices had to be made. And we THANK all those people from the bottom of our hearts. We all have more. Because they gave up some of theirs. Retired Senior Highway Engineer, Lewis D. Whittall. That wouldn’t be a biased opinion at all, would it, Mr. Whitall? I see cars as both a blessing and a curse, and I, for one, mourn the disadvantage of having our public transportation eradicated. Ever been to Europe? It works remarkably well there. I believe it could have continued working well here, too. We’ll never know for sure… Thanks for your comment. You do have a good point…more of them could have been depressed, landscaped, and equipped with sound walls, though; the “440 Parkway” in Nashville and the T. B. Watkins Parkway (AKA the “South Midtown Freeway”) in Kansas City are good examples to follow….although property acquisition and relocation were necessary for these routes to be built to facilitate real world transportation needs to provide access to and from both other cities and to and from downtown, which are now economic engines once more, Indianapolis’ lack of leadership and innovation in the case of both those promoting freeways and those against same missed some real opportunities to both provide better access from, say the north-northeast (which was well documented well before the advent of the interstate highway system in 1956) incorporating both vehicular and transit access to the most heavily used corridor in the Indianapolis Metropolitan Area, namely the “I-169” corridor. Indianapolis is not a “small town”, but much of the mindset of leadership thinks that way…unfortunately. Yes, I hope I’m not coming off as bitter about progress in this article. Obviously I understand that progress has to be made to better our lives, but at the same time I think public transportation needs to be re-introduced to our city. I wasn’t even alive during the construction, so I never had a personal connection with any of the buildings demolished. However, there are multiple octogenarians on the street I live on in Fountain Square who still do get upset about the construction, about how it cut them off from downtown. How it made their lives more inconvenient, especially with having to drive down to Southport or Greenwood for certain shops, but I suppose that was all bound to happen eventually. FYI: The interstate system’s methods of appraisal and reimbursement prior to 1971 were inadequate for relocatees (owners, renters, and businesses). the Brooke amendment (Uniform Relocation and Real Property Acquisition Act of 1971) corrected the bulk of these issues; had the system been built after 1971 the negative effects coming with this system would have been mitigated to a great extent. Design improvements would have also helped…the T B Watkins Parkway in KC and the 440 Parkway in Nashville TN are examples in that regard. Wow Basil! I didn’t even think to look into that. Thanks for sharing! Jordan, was this bound to happen? Perhaps, but it seems like we can do better and there’s hope for the future. Whittal, there’s progress and there’s smart growth. This state, like others, turned it’s back on all other modes of transportation and lost many important historical structures in the process. it seems we are only now beginning to recognize this. I feel like our city has been notoriously bad at protecting historic buildings, when compared to other older, large cities. I think we’ve finally gotten our act together in the last 30 years but there’s so much work to be done. It’s pretty sad that City Hall is still vacant- in other cities I believe it would have been repurposed and renovated immediately. We have a long way to go I’d say! This is a good point. In general when it comes to advancing anything progressive, it at least seems to me that Indianapolis’ “leadership cabal” is always catching up…the city seemed to lose its “progressive” spirit under the reign of Mayor John Duvall in the mid 1920s and didn’t regain any semblance of it until the John Barton administration in the mid-late 1960s, with A LOT of missed opportunities in between. This lack of a progressive approach affected all venues of public or civil life in Indianapolis. At least that’s my take. Great article. The one thing to consider, however, when it comes to depressing the I-65/I-70 innerloop is that in the area around where the old New York Central/Nickel Plate/Monon cross under the interstate is a creek – Pogue’s Run. (Which, anyone who has studied the history of Indianapolis in any extent knows, has been a problem since the very creation of the town of Indianapolis in 1821.) 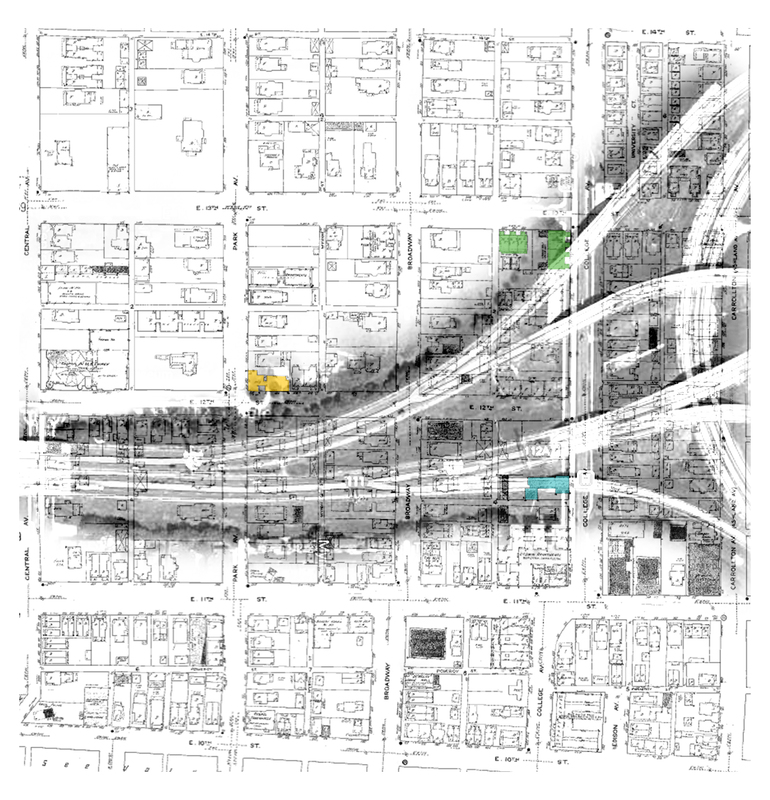 Pogue’s Run is still there, running underground from below Vermont St. to around/under Banker’s Life Fieldhouse and the railroad tracks at Union Station, towards Meridian and South Streets. I look at ALL of the neighborhoods in Marion County that were split up during the Interstate building era. There were a lot of people displaced in the end. But she is right…Indianapolis has little respect for ANYTHING historical. Progress has taken its toll on lots of things in the Indianapolis area – including some of the historic roads. Now, where do we go from here? I see where you’re coming from…the good thing is the “West Street” connector wasn’t done…if the connection between the North Split and Castleton would have been built with the other two routes (I-70 and I-65), that “misssing” connection would be there now. that particular one was pre-interstate proposed along with Madison Avenue, but “muddled” “leadership” didn’t get it on the interstate list till it became controversial…so now all that traffic is shoved onto I-70, after heading south on I-465…so its now a “mess” no matter how the cake is sliced…the same with I-74, which was supposed to run osutheast to northwest versus around I-465. The good thing is West Street wasn’t made the west leg (unless it were depressed, maybe?). Better urban planning would prioritize maintaining neighborhoods over adding more asphalt, cutting down trees, and increasing pollution and noise. These poorly conceived freeways have dramatically decreased quality of life. Opting for more roads instead of investing in rail travel and public transportation was not a smart decision. Smart planning is not just taking advantage of modern technology without considering the impact. Other countries are leaders in the world when it comes to public transportation, which from my experience living in Italy, was convenient and pleasant. Thank you so much for writing this!!!! This highway question has been burning in my mind for months and now I’m so happy I wrote in with my question. I’m so happy to read such a well written and researched article. This really reinforces my positive feelings for this blog and the city. Thanks, Meredith. There are so many more apartment buildings that were demolished – I had a hard time choosing which ones to tell my story with. If you’d like to read more, the Polis Center at IUPUI has done an amazing job documenting everything – especially with a focus on the west and northwest construction. Also, there’s a professor at IUPUI by the name of Paul Mullins who studies these things and wrote a book recently on the destruction of the neighborhood which IUPUI resides on now. It’s pretty interesting what we will destroy in the name of progress. Excellent work, Jordan! Thank you. Fantastic research. I’m in the process of writing a novel that set in a very fictionalized version of one of these wounded neighborhoods. Well done. That is very interesting, William. Let us know when the novel is complete! And thanks! Thanks, Jared! The first place I moved downtown was at 9th & Penn. The area is very dear to me. There were so many other apartment buildings – and not to mention all of the houses – it was really hard to decide which ones to write about. I could honestly probably spend a year just on I-65 construction! I love the area. It saddens me to look at the maps and see how many areas were completely just wiped out by 65 / 70. Every time I walk my dog in this area, I think of it since reading this post. I have always wondered if Ike had not had such a negative reaction to rail travel and had used the power of his office to include a 2 pairs of limited access rail tracks with the interstates what the result would be. Of course the railroads still had power and would have fought it. Very true, David. I’m sure things would be so different today. My home (actually grandparent’s) was one that survived. 615 Prospect now looks over the interstate. Many good memories of walking to Fountain Square to shop at the stores. Great article. I believe there’s is much more to discover in this area, especially the experiences of those that were directly affected by the city’s decision. I had also wondered the impact on certain neighborhoods or areas that were divided by an interstate – how cultures, values and attitudes varied over a period of time. Interstate 70, although initially appearing as an economic boon to Indianapolis, made a devastating tear through the city’s central core. From 1965-1969 I attended Cathedral High School, then located at the northwest corner of 14th and North Meridian Streets. To get there from our Eastside home, we drove Mass. Ave to Roosevelt Ave. which linked up with 13th Street. Thirteenth Street was a busy east-west through street that was completely wiped out by I-70. Its streets were lined with stately homes from the late 19th and early 20 centuries, many of which met their fate with an “urban renewal” wrecking ball. The Eli LIlly expansion required more land and displaced more near-south neighborhoods than the highway did. 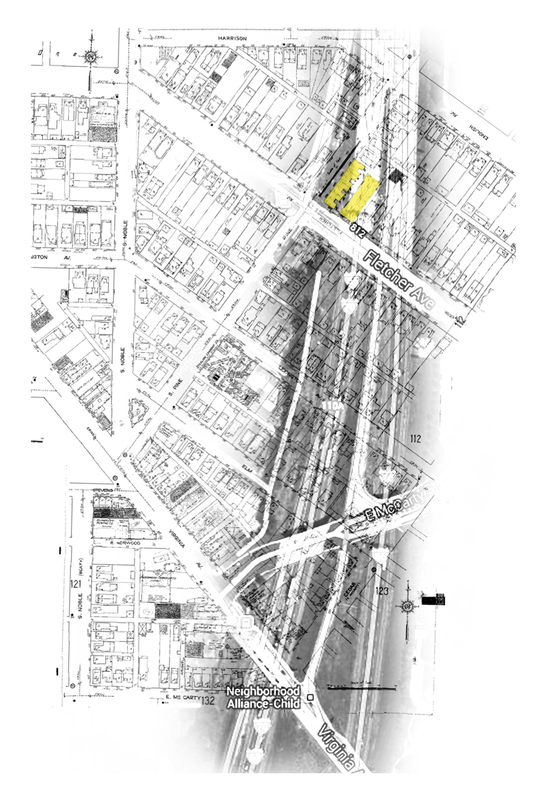 Before that it was the railroads that walled off the southside. That said, I-65/70 could and should have been built with a smaller footprint, but INDOT had little experience with urban freeways at the time. Access to major highways is now a plus for the area, although the location of the access ramps could have been better designed too. Like it did eight or so years ago, INDOT’s upcoming full closure of the I-65/ I-70 commons and the very limited traffic congestion problems that will occur as a result will demonstrate the freeways inside I-465 are not necessary, especially these segments slicing through the urban core. Through traffic will divert to I-465 and local traffic will find that there is plenty of excess capacity on many of the urban arterial streets. Will we realize this time that we can indeed remove this unnecessary freeway? Remember when I-65/I-70 opened? They cut the ribbon and let everyone on on it. The only trouble was all the accidents at the I-65/I-70 split and the police didn’t know where anything was. This time, let the coppers have if alone for a few days to get their bearings. Wonderful article! I especially liked the original floor plan of the Walbrook Flats, as they have changed drastically! Was the 1970 demolition a typo? I live there!! I am editing my grandfather George Rafert’s diary (Volume 3) for the years 1923 to 1927 at present. In January 1926 he began planning for the construction of the Charmwood Apartments on the lot that his house (now known as the Furnas House) sat on. He worked with architect Merrett Carr and created a corporate entity for the apartments and the house which he then sold most of, but retaining an interest. I’m not sure that this location, known as 3435 North Pennsylvania Street (across the street from the rear side of Shortridge High School) is in the Old Northside. However, the apartments were renovated in the 1990s and the Furnas house turned into condos and the whole area became a gated community. It is fortunate that the Charmood Apartments survive and apparently are successfully rented, as are the condos. I did a Google search of Merrett Carr and could not find any information on him. However, I found a landscape plan for the Furnas house by Merrett Harrison, dean of Indianapolis architects in the 1920s to early 50s when I was removing blueprints from a later Rafert house in Fortville. I donated the blueprint to the Indiana Historical Society which is now restoring it. I believe the plan was made about 1916 or 1917 for Dr. Hamilton, the builder of the house. Does anybody have any further information on this site? Good luck in your search! Now that I’ve seen the name, my antenna will be up! In reference to the brick building at 1104 N College. It was not demolished and is still standing. Of this I am certain, it is the same building that housed a drugstore and grocery. I grew up in the area. Plus, Google shows the building in 2014. Thank you for showing all the buildings regardless. Takes me back. Remember all of them. What a great article! Thank you so much for doing this research and enriching my knowledge of our City’s history!